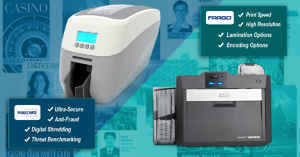 While having the right ID Card printer is essential for producing great customized ID Cards, equally important is the ID Card printing software that allows users to design cards, manage cardholder data, access and deploy security features, and ensure card production efficiency and convenience. Organizations can better govern their essential security functions and prevent security breaches using ID Card production software for employee and visitor identification programs. It�s ID card software that empowers organizations to intuitively and flexibly design/create unique professional cards, with backgrounds, dynamic fields, shapes, images, and placeholders. 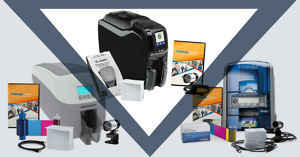 Today�s ID Card printing software offers features that render the card design, printing, and data organization functions highly efficient�a real time saver. Photo, image, and background options. Barcodes and magnetic stripe encoding. Custom field names and formatting. Connecting to Multiple Database Sources � A key value of good ID card software is its ability to manage, link to, and import cardholder data and remain ODBC compliant. These software engines simplify the card-creation process and can dramatically improve printing speeds and minimize data input errors by streamlining the process of importing data. Software can also enable users to share and work on cardholder identities on several systems simultaneously, streamlining the card-printing process between divisions and offices. Encoding � Software enables cardholder identity data to be encoded directly onto cards (mag-stripe, contactless, smart chip). Entry-Level ID Badging Solution � Create basic IDs within minutes. Premium � Supports use of MS Access database connections, offers connections to multiple database columns, and stores photos and images in user�s database. 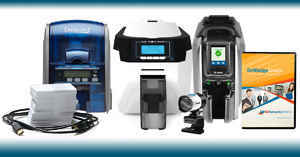 Professional� High-level database connectivity, and stores photos, signatures, and images in multiple databases. Ultimate: Fully-featured software that includes contactless encoding standards like MIFARE� Classic and DESFire EV1. Asure ID Solo: Simple, entry-level card personalization software. Asure ID Express: Powerful, stand-alone card personalization software. Asure ID Enterprise: Card personalization for multiple workstations sharing a common database. 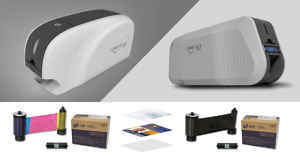 Asure ID Exchange: Support for more sophisticated secure credential applications, providing advanced smart-card functionality and laser engraving. 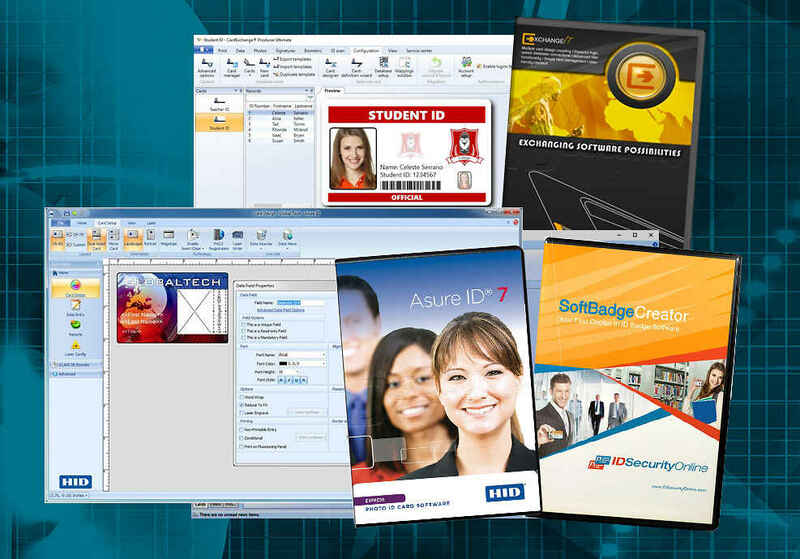 SoftBadge Creator ID Software offers five versions (Basic, Standard, Professional, Enterprise, and Ultimate), which together accommodate all the ID Card printing features available today, from basic features for card design and printing using predefined templates, signature acquisition, edit view for text data input, database view, and barcodes 1D, to magnetic encoding support, internal document database with photo connection, fingerprint acquisition, contactless RFID encoding, connections to external databases, and Mifare DESFire. 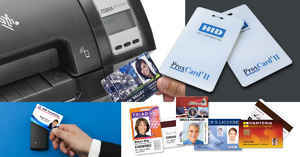 What ID Card Software is Best for You? That depends on your organization�s ID card requirements. Single workstation installation (no networking). Manual data entry, and no outside database connections. Cards printed one at a time, without batch printing available. A limited 200-record internal database. 1D barcode or encode magnetic stripes. Mid-level options are most advisable because their batch-printing and database features make ID card printing more efficient and streamlined for any organization. These offer external database capability, including the ability to save and search cardholder records. Fully featured software is the recommended choice for organizations with multiple locations, mixed database types, and a need for advanced card encoding. To ascertain which software option will work best for your organization, try �test driving� it with a free 30-day trial. Design cards, build a database, add fields, and check other features. Then when you buy the license, you�ll be ready to go. It�s also important to consider software support plans and training to ensure your team gets the most function and managerial advantage out of your ID card printers. For more information, call 1-800-897-7024, chat live with us, or email us at [email protected]tyonline.com.